Spicy Orange Moroccan Salad ~ this is a fruit salad like nothing you've ever had before, I promise! 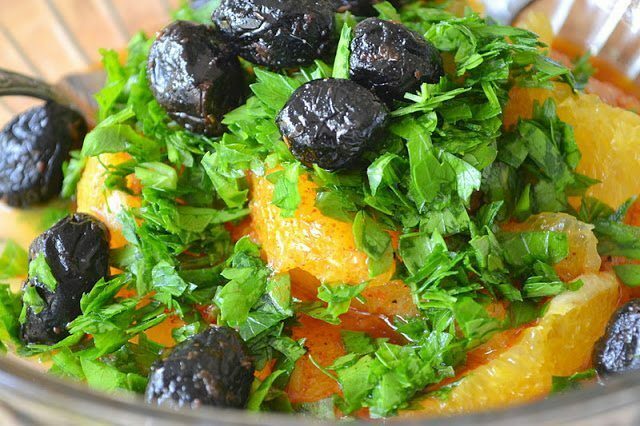 With fresh juicy oranges paired with earthy oil cured olives, tons of fresh parsley and a burst of cayenne, this unusual Middle Eastern citrus salad will blow you away. 12 pitted black olives, preferably imported Greek or Italian. Peel the oranges, paring away all the exterior white pulp. Cut each orange into wedges. Cut each wedge into 1-inch pieces. Set aside.